All I can say is WOW. It was so smooth with no tuning at all. Very precise control. No jumping around. Unfortunately I had a "Bad Logging" problem which looks like an on-going problem with Arducopter. I turned down the logging and the log buffer and the IO heartbeat and BAD logging errors are gone. But I will have to do my basic test again to get logs to check the vibs and battery usage trends. I can't wait to take it up with the gimbal. Welcome to my blog. Hopefully you will find something worth your visit. UC4H part 4: UC4H: Son of FrankenSolo gets ESCs! Pixraptor Pixhawk clone with sensor suspension, a better pixhawk? Pixhawk LITE, a replacement for the now obsolete APM boards? New Status display for Pixhawk replaces beeps and flashing lights. What's wrong with cheap props? All good things come to and end and so it is with the Son of FrankenSolo. What a fun project. I built a gimbal for this project using OlliW's STorM32NT gimbal controller. OlliW has provided excellent compatibility with Ardupilot and your choice of connection methods. You can use PWM, Sbus, Spektrum or serial connections between the flight controller and the gimbal. You can use Mavlink or OlliW's own STorM32 mode serial. Lastly you can use native mode STorM32 as I did which is a serial connection and the Betacopter branch of Ardupilot which includes OlliW's improvements for his gimbal. Native mode has the richest set of features. Display Type =0 for 1306 based or =1 for SH 1106 based displays. RANT: Lamenting the loss of standardization. When I was going to engineering school, admittedly a while ago, my professors pounded into us the value of standardization. I find that those admonitions are clearly lost on the current generation of engineers. They seem to think that if they can improve something by 1% it is worth throwing away everything that has gone before. To lose compatibility, standardization and the ability to source from different vendors. The value of standardization to the consumer is not to be underestimated. But the value to sales and marketing seems to be to maximize profits at the expense of the customer. Too many customers these days fail to understand the products they buy. They don't do their homework. So when the company brings out the next cool bleeding edge product the consumer fails to recognize that the parts in the product are proprietary and they may go obsolete sooner than later and then the item will not be repairable. Another item in the landfill. I am tired of buying gimbal motors with entirely different bolt patterns and entirely different than the gimbal frame kits, so nothing fits. I am tired of multirotor frame manufactures making frames that no flight controller or PDB can be fit into. The only benefit to this level of incompatibility is to force the buyer to buy all their parts from the same vendor. The problem is that vendors have also decided they don't have to provide technical documentation for the products they sell because customers don't require it anymore. Like most things CANbus Ardupilot is a little behind the game. We have come a long way on this project from setting up power, installing the ESC's, adding GPS and Mag, getting information from the Notify display and adding the rangefinder for more accurate altitude measurements. The SLCAN tool and the UAVCAN GUI software has given us a great way to monitor data on the CANbus and configure our can devices and troubleshoot. It still allows us to troubleshoot those devices even buttoned up inside the multirotor. We get an unprecedented view of what is going on inside the quad in real time instead of waiting until the flight is over to review the logs. With UC4H we know what the rpm of the motors are and what the temperature of the ESC's is at. We know how many satellites we have locked and that the EKF2 as initialized as examples. But some of use grew up using Mission Planner and with all the benefits of UAVCAN GUI it would be nice to integrate Mission Planner and UAVCAN. So OlliW developed a way of linking Mission Planner to the CANBus and allow us to connect with CAN devices on our multirotor just like connecting to the flight controller and downloading the parameters. With the UC4H Mavlink Bridge we can get our CANbus information right in the Parameters with all the other aspects of the flight controller we configure. The UC4H Mavlink Bridge sits on the CANbus and connects to the Pixhawk via a serial connection. It is created using our multipurpose General Node. So simple and so powerful. The continued epsiodes of the Son of FrankenSolo build. Using Olliw's UC4H and a 3DR Solo surplus motherboard to create and advanced DIY quad. I have gotten the UC4H powerbrick, UC4H ESC's, UC4H Display Notifier and UC4H GPS/MAG/Baro installed. Kinda the required basics to get flying. Now for some frosting on the cake. I have wanted to experiment with a downward facing sonar since the APM days but the sensors available have always been marginal or quite expensive. The old HC-SR04 did not do much. The Maxbotix had noise isssues to deal with and the true LIDARS were in the hundreds of dollars. For low altitude measurements Pixhawk depends on it's barometer. But the Barometer senses air pressure and that changes with the weather. So adding a better sensor for low altitude height measurements could improve landing and AltHold flight mode. The new kid on the low altitude sensor block is the Benewake TFTmini LIDAR. It is not a true LIDAR (Light Detection and Ranging) because it does not use a laser. It instead uses a less costly LED light. But it seems to work well and is moderately priced at around $50. OlliW took advantage of this new sensor and added it to UC4H. The UC4H Rangefinder. It could use the UART Tunnel technology but it is easy to setup and use as a UAVCAN device or the generic mode. Adupilot is heavily dependent on GPS for accurate position information. It uses position information for all the various modes that set it apart from other flight controllers. Auto missions, loiter, position hold, follow me etc etc all require a great GPS lock to function. Ardupilot has made great strides in recent years by implementing dual GPS capability and allowing the evaluation of the GPS signal quality and switching to the best GPS or blending the data from the two GPS. It brings greater reliability to Ardupilot. In my first FrankenSolo I used a UC4H GPS node to convert a Here GPS to UAVCAN. This conversion caused the Here GPS to send out UAVCAN messages with GPS information to the CANbus. In the second generation UC4H OlliW has implemented a new message type that is a tunnel to send serial data to the Pixhawk. The new message has raw serial data as a payload and allows any serial device to create a tunnel to deliver that data to the Pixhawk without creating special UAVCAN messages for every serial device. So I am replacing my old UAVCAN node with a new gerneral purpose node with the GPS/MAG/Baro firmware. The GPS data uses a serial_TUNL to get its data to the Pixhawk and the compass and or barometer send their data through normal UAVCAN messages. There is also a general purpose node firmware to provide nothing but serial tunnels. The firmware is called the UART Bridge is used to provide extra serial ports to the Pixhawk from about any serial device. I used the UC4H Notify display as an example of flashing the firmware to a General node now I'll just finished up that project. The UC4H is similar to the Ardupliot status display. It is really useful to get some important information before you fly without having to haul around a ground station. It is particularly important to have a good GPS lock before you fly with Ardupliot and a simple LED on your GPS indicating a 3D Lock is not adequate. The Notify display gives you the number of satellites you are using and the quality of the signal. It also has a ticker tape line that gives you the messages that you would normally have to get from the message tab in Mission Planner. It will tell you what your battery voltage is and all in plain text rather than having to decipher sequences of blinking lights or musical tones. The notify display using a cheap and commonly available SSD1306 .96" OLED I2C module. Becarefuyl to note that these modules can look identical from various vendors but instead, stupidly, have the power and ground pins reversed from module to module. UC4H Pixhawk Cube Carrier!!!! UAVCAN FC first look! OlliW's new Pixhawk Cube carrier for UAVCAN. Very exciting. Amazing! I did not melt my ESCs into slag and they all work. Yippie! One of the nice things about a UAVCAN ESC is it doesn't need to be calibrated like a standard PWM ESC. But you do need to configure the ESCs, each with a unique node ID, and set them up so they are in the right position on your frame. To set the node ID we go into the UAVCAN GUI, click on the automatic Node ID server, and let it assign a random ID so we can see the node. Then we simply open each ESC node, click on "fetch all," and then change the node ID to whatever we want. Each node can have any ID up to 126. I am setting mine so they are 60, 61, 62, and 63 but it could be 34, 68, 92 and 101. You can choose any ID as long as each node has a unique number and it is not greater than 126. Be sure to click "save all" afterward to change the ID for each ESC. There is an index to identify the ESCs. I have four ESCs so the count starts at 0 then 1, 2, 3, unlike the Ardupilot count that starts at 1. Each ESC needs to be associated with it's Arducopter arm/motor number. Don't be confused with Arducopters motor test which starts at the upper right and goes one motor at a time clockwise labelling each motor in turn A, B,C and D.
For Arducopter, my X frame (picture on the right), motor order is upper-right motor 1 then, going clockwise around the quad, lower-right is motor 4, lower-left motor is 2, and upper-left motor is 3. UC4H: Son of FrankenSolo gets ESCs! I hate doing ESCs. Because of my unexceptional soldering skills, I tend to melt them into a pile of slag. I'm going to try real hard not to do that today. I could use the general-purpose node and program it for ESC. It would have the advantage of being able to use one general-purpose node for all four of my ESCs. The ESC firmware supports up to 6 PWM or 4 Dshot outputs. Just a reminder that you can make all these UC4H devices with simple "Blue pill" STM boards that are really cheap. They may not be as neat and clean but it makes UC4H super accessible. Ok, I got the basic platform up and running. The UC4H Power module is powering the Pixhawk 2.1 Cube and the CANbus. I can connect to the Cube with Mission Planner and I have installed Betacopter 3.6.6 from OlliW Github respository. OlliW has provided pre-compiled versions for three standard flight controller FMUs. Use ArduCopter-v2.px4 for standard Pixhawk 1s and Cubes. Use ArduCopter-v3.px4 for Solo boards and ArduCopter-v4.px4 for newer boards like the Pixracer. You do this by going to the install firmware tab in Mission Planner and Load custom firmware. Loads just like any normal pre-compiled version of Arducopter. Now we can have some fun. The SLCAN device is a basic tool for monitoring the CANbus. If you are a network type it is like an ethernet network sniffer. 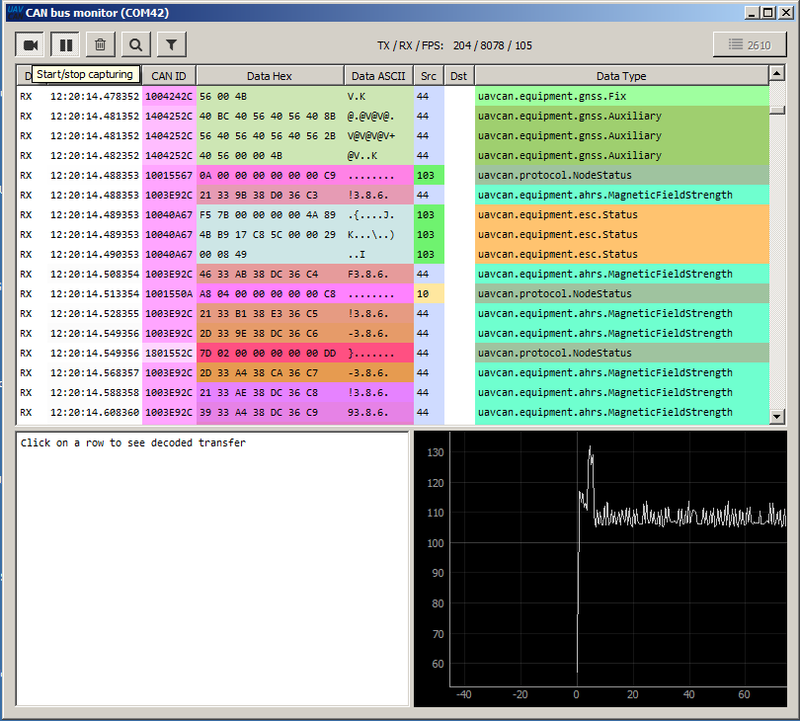 Think Wireshark or Bloodhound. It listens in on the bus and can capture the messages going by. You can make one or buy one from Jdrones or Zubax. The UAVCAN GUI tool gets this info and displays it for you. So get UAVCAN GUI from the UAVCAN.org site and install it. Plug your SLCAN adapter into your computer via USB and a CANbus cable is plugged into one of the two CANbus ports and then to your CANBus. In the following picture you can see my SLCAN plugged into my computer and then to my CANbus expander. I have checked that the UC4H Powerbrick and the Power Distribution Board are connected correctly and working. The correct 5.3v is powering the CANBus. I am using JST-GH expanders made by MRO which he makes for I2C but work for the CANbus. The CANbus is not designed to be a STAR topology but a daisy chain. But given the short distances involved on the quad it just does not affect anything negatively and it is so much easier to use the expanders. I received all my UC4H modules from Jani at JDrones and some modules OlliW built for this project. Thanks, OlliW! I'll use a UC4H V2 Powerbrick to power the system. The Universal Modules for GPS, Serial Bridge, Mavlink Bridge, LED Notify and Display will finish off the system. I'll use OlliW's UC4H Kiss 32A ESC carriers but I could use Universal Modules for the ESCs also. I suppose the place to start a new build is the power supply because everything depends on reliable clean power. One of the problem areas and points of confusion in APM/Pixhawk builds over the years has been supplying power. The flight controller is a flying computer with sensors. In order to operate it needs clean reliable power to stay working and to evaluate its sensors accurately. So you don't supply power to your flight controller from a BEC on your ESC. Those voltage converters were made for simple devices on airplanes, not the rigorous requirements of a flight controller. Also, we can't power everything in the whole world off our flight controller power module. So just don't do it. Use a separate voltage regulator for other devices that need significant power. A flight controller pulls a few hundred mils so don't think about powering a 1 amp 5v led strip with the flight controller's power module. When I discovered the 3DR Solo main board as a building block for DIY, because it has a Pixhawk 2 and a companion computer with HD video and telemetry for a very cheap price, I built the FrankenSolo. I used a recycled set of plates from a Daya 680 because it was wide enough for the Solo mainbrd. But it is not necessary to use a Solo mainbrd, all of this could be done with a normal Pixhawk. But as with most DIY builds I had to do a lot of bubble gum fitting and compromising to get it all to work. The quad flew better than any of my previous builds and I was sold on the concept. I used OllW's UC4H components to bring UAVCAN to the build. My reason to use Ollw's UAVCAN was to have a build with cleaner simpler wiring and real time monitoring. I have been looking for a gimbal that will support and work well with a Sony Nex mirrorless camera and not too expensive. I am not in the market for $1000 gimbal. Plus I really want to make it myself. I have built a lot of gimbals and early-on I learned that the wires running sloppily all over the place will never allow for a really good gimbal. The prop wash and rubbing of the wires totally messes up the stabilization. So for me the wires must go through hollow shaft gimbal motors and be dressed cleanly and tightly. Two, the gimbal must be adjustable enough to properly balance a bigger Nex sized camera. I played with the DYS that is popular but the way they attach the camera platform to the pitch gimbal motor blocks/precludes running wires through the hollow shaft pitch motor. Next promising was a gimbal from GoodLuckBuy similar to the MOY, but the movements are not adequate for me to balance my Sony Nex 5 even though it is supposed to be designed for the Nex. I finally found a possibility and that is a gimbal sold by Hobbyking and others called the Stormeye 5N, made by FCModel. It is cheap and it has a two point support for the camera platform. It is light but some of the parts look weak. The gimbal motor attachment plates are flat pieces of carbon fiber so it would be relatively easy to get replacements made to fit the gimbal motors I want to use and to add a third axis plate since the stock gimbal is only two axis.